A couple of months ago I told you about the beautiful “Sea Glass” pet bowls waiting to be born. Well, the Kickstrater project was funded and ours have arrived. 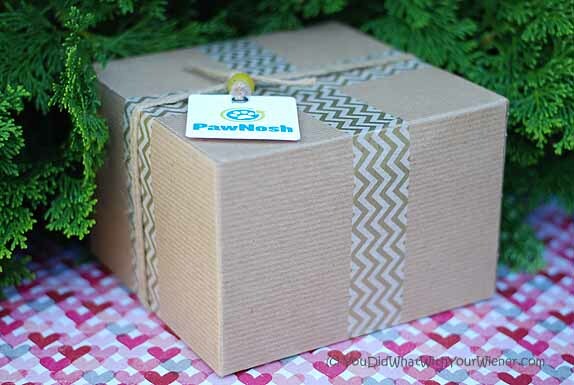 I couldn’t be happier with our PawNosh Cubby bowls. 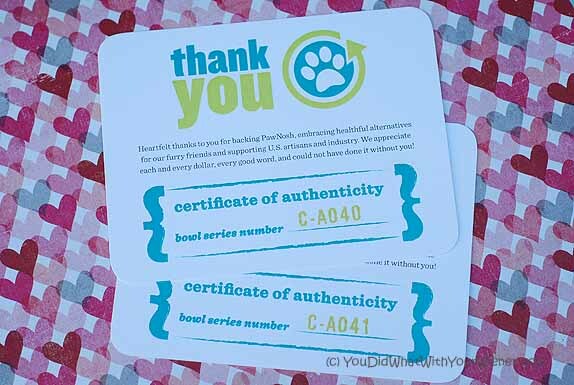 First, they came in these beautifully wrapped boxes with authenticity certificates (getting in early on the Kickstarter campaign got us two limited edition, first run Cubby bowls). They bowls are made of recycled glass that is a beautiful, translucent light blue-green. 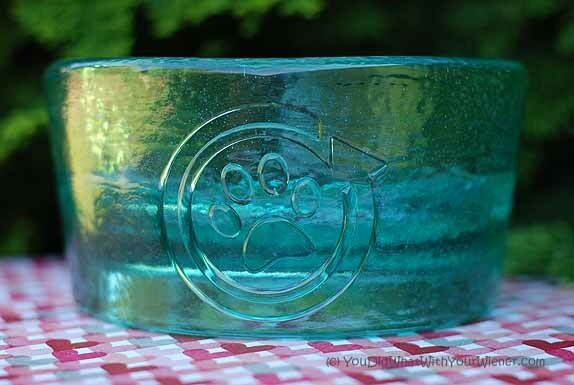 I love things recycled and pets so I think the logo on the front of the bowl is perfect. I think these might be the last pet bowls I will ever need to buy. The bowls are very heavy and sturdy. Baring a catastrophe, I don’t see these bowls ever breaking or chipping (even in our old, cast iron, porcelain sink that seems to have it out for every piece of glassware we own). I think this design could blend in with any type of decor – modern, shabby-chic, punk/edgy, eco-chic, etc. As my style and tastes change, I could see these bowls adapting. You can purchase a bowl for yourself from PawNosh.com. They are made of 100% recycled glass and hand-pressed in the USA. They come in two sizes – the one we got for dogs under 25 lbs or larger ones. Check out more photos, and get updates, on the PawNosh Facebook Page. We love these bowls too! So glad to hear that your tried them out and love them. Love love the color and the idea. Beautiful! I saw this Kickstarter campaign and – to be totally honest – thought that a glass bowl didn’t sound so safe. But from your experience, I’m glad to see that I was very wrong! They’re so pretty, and I adore the logo. I’ll have to give them another chance! Those are beautiful. I should probably replace the mismatched plastic and metal and give my dogs some class with the cuisine. One of my dogs has a habit of banging her empty bowl on the ground. This might be the answer to that annoyance. Well, Chester and Gretel are 10 lbs but they can’t move these heavy bowls around too much. They definitely can’t flip them over! Those are wonderful! My face is green with envy- I have to get one! Those bowls are SO cool! I really love them! Those bowls surely are unique and beautiful! But I’m glad you reminded me about them so I can check out their site! Wow, that bowl is so pretty! 🙂 I used to love ceramic bowls but I got over them when I broke the last one in half with a tennis ball. Never tried anything but plastic/metal since, but I might have to look into this! This one certainly won’t break! I really like those… and the little logo on the front is so perfect like you said. Wow, these bowls are gorgeous! I wouldn’t have ever thought that a glass bowl could work well for pets, but now that I see your photos I’d really love to try one for Daisy! OMD! We love those bowls! And they are made from recycled materials? Just perfect. We LOVE these bowls….wish we would have known about them when the Kickstarter was first up! Question: My yellow lab carries off every bowl I have ever used and throws them around the house. I am looking for something so heavy or deep that she can’t pick it up. What do you think? It’s hard to say. This bowl is not so heavy that a dog couldn’t carry it off. However, it’s glass so it’s slick and is probably hard to get ahold of.